Helen and I went out today by ourselves to have a ride. 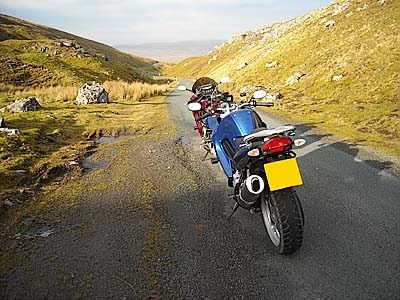 She initially wanted to go to Tan Hill, but what she actually wanted to do was go over Buttertubs Pass with the big drop on the left hand side. This was to get some practice of riding near sheer drops in anticipation of going over the Pyrenees in June this year. It was quite cold today and some of the roads were still damp in places. We headed out at about 10:45am and proceeded to our first stop at Settle for a coffee. 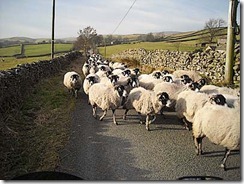 We travelled via the M66/A56, over Sabden and via Sawley to Settle. A handful of bikes about in Settle but it was mainly cars parked up. 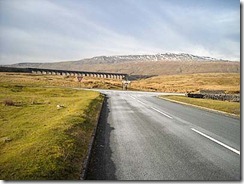 After the brief stop we headed out to Hawes taking in the great roads via Ribblehead Viaduct. On our way through Hawes Helen stopped at the toilets which I didn't noticed and had to turn around when I eventually realised she wasn't behind me any longer. Because she wanted to do Buttertubs Pass with the drop on the left side I got the map out and planned a route via Askrigg and Muker to get to the start of Buttertubs Pass. 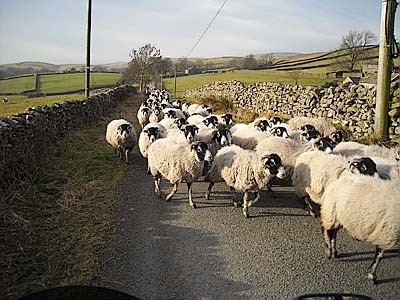 However we took a left turn too early and headed up a dead end road (missed the sign at the beginning of the road), took another left turn and we were confronted by about 200+ sheep coming in the other direction. After eventually coming to the end of the road, we turned our bikes around and headed back to the main road. We eventually found the right lefthand turn and went over the top of Askrigg Common and on the way down encountered a 1 in 4 descent at Crow Trees. 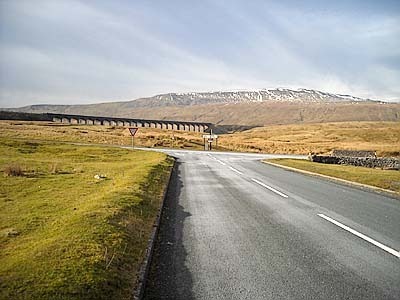 We eventually got to Buttertubs Pass and Helen actually drove on the right side of the road for once and braved riding near the edge. We then stopped in Hawes for some much needed supplies and headed home back via Settle, Wigglesworth, Sawley, Saben and the A56/M66.